Dayton Smith’s journey started at birth when mother Elaine was rushed in for an emergency cesarean. Dayton then spent the next 7 weeks in the intensive care at Stamford hospital whilst his oxygen levels remained a problem. It was only after a blood transfusion that Dayton was cleared to eventually return to the family home in November 2012. However the issue with Dayton oxygen levels and breathing was still a problem, he would stop breathing whilst being fed and would choke on food and drink consistently. 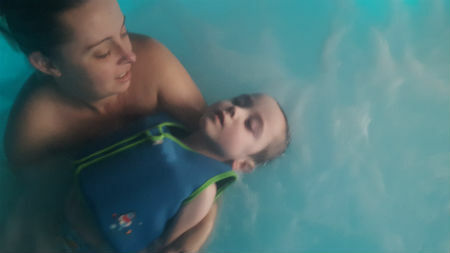 After 6 months of worry and being in and out of the hospital, parents Jamie & Elaine booked an appointment with a specialist paediatrician and this is where they were told the news that Dayton had cerebral palsy. The news was devastating for all but Jamie gathered himself to pledge to raise money and awareness about cerebral palsy and work tirelessly towards providing Dayton with the support and resources to give a life he deserved. Elaine & Jamie was also advised a hot tub with good hydrotherapy would benefit Dayton & should be part of any project. 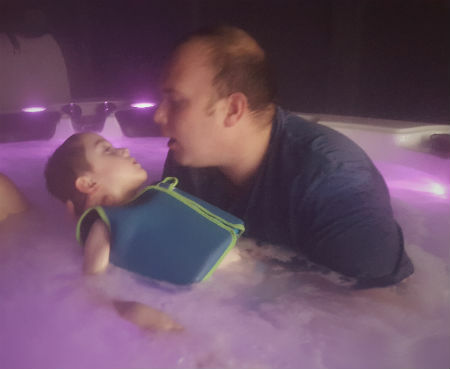 This after countless fundraising and hard work we received a call from Jamie and he ordered the Emperor Deluxe model from Hot Tub Suppliers which was delivered this year. Dayton uses the hot tub 3 to 4 times per week and the benefits have been fantastic. Dayton can sit for a few seconds unaided and can walk in a special walking frame …and this is just from having the pool for 6 months we can't wait to see the progress in a year's time. The Hot tub has been fantastic but of course, the most important part in this whole process is the tremendous strength and character of Dayton plus the support and bond of his loving family. 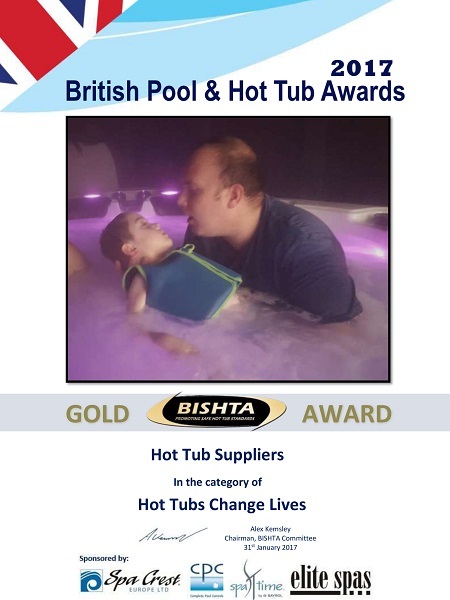 Dayton was the Gold Award winner at the British Pool & Hot Tub Awards 2017.